Agrapart leads a competitive field for the Ryanair Stayers Hurdle. A smart recruit last term from France - finishing second on yard debut in the Relkeel, before going one better at the same venue in the Cleeve. Did not figure at Cheltenham or Aintree, and clearly something has been amiss then, pulling up most recently behind Paisley Park in this years Stayers Trial in January. Needs to reignite that spark, but hard to do so if he is not the same horse as he once was. Easy win in a Class Two Handicap at Prestbury Park on new year's day, before down the field in the Cleeve Hurdle three weeks later. Chose to bypass Cheltenham for a spot here, but really comes into this with ground to make up on his rivals. If returning to top form that he showed in that handicap at the start of the calendar year, his name should be spoke of in being involved in the outcome to this race. Best runs have come in this part of the world - in particular at Haydock, but was an excellent third to L'Ami Serge in the Aintree Hurdle at big odds twelve months ago. Since then he has been sighted just twice and been out of contention in both, but a player if song will have the benefit of arriving here fresher than horses that competed at Cheltenham. Creditable season it must be said, failing to finish outside the top three in four events. Was a good second on return to Verdana Blue in the Elite Hurdle at Wincanton on return, and was expected to come on for the run, which he did so when landing the spoils in the Coral Hurdle at Ascot. Not close enough to challenge the Henderson duo in the Christmas Hurdle, but finished a clear best of the rest, and was a much closer second in the National Spirit Hurdle at Fontwell. Been running well, and would be no surprise to see him play out the finish. Chasing campaign failed - despite winning on his first start over fences at Ffos Las in November. Never on terms at Newbury in the John Francome Novices Chase, so was switched back to timber and went into the Stayers Hurdle with obvious claims. However again, he was never a factor and hung violently left at times giving Harry Cobden a nightmare in the saddle. Gamble landed in the Grade Three 888Sport Heroes Handicap Hurdle at Sandown back in February off a nice weight, but could not follow that up at Uttoxeter subsequently. Does hold excuses that day with the ground on the heavy side, and did make some nice headway through the race. Wouldn't argue the track completely suits his needs, but has rapidly risen up the handicap for more than one reason. Set the running in the Stayers Hurdle last month to ensure his name was heard more than once, but ultimately the pace he set came back to bite him. His legs were never going to stay the distance in the end, and weakened tamely from three-out. Hard to consider in this, and appears to operate best in handicaps than at the top level. Last season's star British stayer had several questions asked of him after this year's performances, after cheap mistakes cost him unseats at both Newbury and at Ascot. Was miles behind Paisley Park in the Cleeve, but pulled it out of the fire in the Stayers Hurdle itself, when running like the Sam Spinner we truly know, when taking the Emma Lavelle 7yo all the way to the wire. Yes, Paisley Park was always going clear, but Sam Spinner gave him a real test from the front, and ensured that Joe Colliver's rearranging of his court hearing was worth it. Can back that up with another solid effort here. The Bradley Partnership have another chance of an Aintree success with Sykes, who seems to have turned a corner at the grand old age of ten. Two starts this season have corrected the form that concluded his last campaign; finishing a short-head second to The Mighty Don at Cheltenham in a Pertemps Qualifier back in October, before winning at Haydock after a bit of a break. Again has been weighted since, and it appears connections have started to bare in mind his mileage. Could be set for another big day. The Worlds End was two from three on his first three starts over fences, but after a couple of poor attempts at Kempton and at Cheltenham, the McNeill family have opted to swap him back to hurdles. He was pulled up in the RSA, and really needs to correct his jumping. Came home fourth in this contest last year on what was a well strung out finish behind Identity Thief. Did win the Sefton Novices the year before, so arrives back at a track he definitely loves. Unowhatimeanharry certainly flies the flag for the OAP's in this contest, and can't have that much longer in his racing career, which has provided us with so much joy. He just doesn't appear to have the legs anymore, and finished down the field in the Stayers Hurdle, which was an improvement on his early fall in the JLT Long Walk Hurdle at Ascot. Won a nice race at Newbury back in November, but there are simply better horses about now, who are quick and can stay. Do not be put off however him stealing a place. West Approach has never really fulfilled the talent shown by his brother Thistlecrack, but has many creditable efforts to be proud of this term. He was racing over fences at the start of the season, and finished a late fifth in the Ladbrokes Trophy behind Sizing Tennessee - who we have not seen since. Switched back to hurdles, and finished as the runners-up in the Long Walk and the Cleeve, but failed to figure in the Stayers itself. Being a bit more prominent would increase his chances here today. On and off this season, after last season's excellent third in the Stayers Hurdle. Actually went onto finish second best to Identity Thief in this contest twelve months ago, and ran a nice race for his connections. Began this season with a win at this venue and another big season loomed, but he has failed to really get involved in four outings since - the best of which was probably his second in the Relkeel. Two starts this term - pulling up on his reappearance at Wincanton did not really do him any favours. However, after another break and with plenty of schooling completed at Seven Barrows, he stayed on best to win the Coral Cup at the Cheltenham Festival last month, breaking the hearts of Wicklow Brave fans. Was under a big weight, yet ran on strongly inside the final 100yard, and never gave up. Flew past the post, and now steps up in trip to three miles which does look what he wants. Well, well, well. 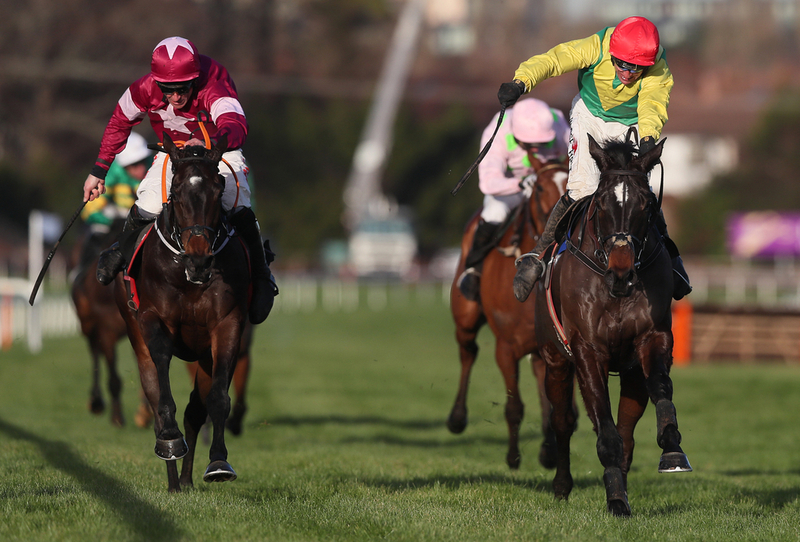 Many were not expecting Apple's Jade to flop in the way she did in the Champion Hurdle, and maybe despite her glittering display in the Irish Champion, two miles and the Cheltenham contours are not set for her. Until then had won four from four this term over three different distances, and steps up to three which many may have felt had suited her last season, letalone this season. Won over three miles at Leopardstown in December, when landing the Christmas Hurdle by 26 lengths. Has lost at Cheltenham and bounced back at Aintree before - when winning the Juvenile contest in 2016 by 41 lengths, and a return to form will definitely be expected here for what is a standout mare on her day. Dan Skelton collected his first Grade One prize, after Benie Des Dieux's tumble at the last in the OLBG Mares Hurdle at the Cheltenham Festival effectively handed the race to this 7yo. If Benie had stood up, Roksana still would have run a nice run finishing second, but she collected the prize, off the back of her third in the Listed Contenders Hurdle behind Buveur D'Air - the second also winning a Grade Two at Fontwell. Top mare, and lightly race. Looks plenty more to come.